Lush Fab Glam Inspired Lifestyle For The Modern Woman: P.S. 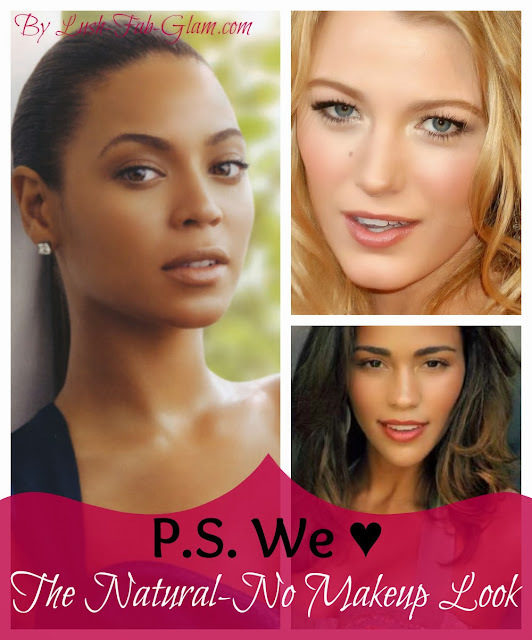 We ♥ The Natural/No Makeup Look + A Fab Giveaway. P.S. We ♥ The Natural/No Makeup Look + A Fab Giveaway. P.S. We ♥ The Natural/ No Makeup Look + A Fab Giveaway. Update: This contest is now closed. Congratulations to Catherine Lee the winner of this giveaway. If you've read our About Page you will know that we describe the Lush Fab Glam Fashionista as someone who 'lives a well-rounded lifestyle and uses her fashion and beauty products to reflect and enhance not overshadow her personality and that's why we love the natural/ no makeup look! It's a fresh and youthful beauty look that's perfect for work, school and running quick errands all while looking like you simply got out of bed and headed out the door without the fuss of heavy makeup application and bright or bold cosmetic colors. Ever wondered why models and some celebrities look like they have perfect skin even when they are unexpectedly snapped on the street. Their secret is that they have mastered the art of the natural/ no makeup look. You can look fabulous and exude confidence too, while wearing the natural/ no makeup look like the models on the runways at New York, Paris and London fashion week or like actresses Jennifer Lopez, Kerry Washington, Blake Lively and singer Beyoncé who are all known for their beautiful skin and minimal makeup looks on and off the red carpet. Hollywood cosmetician Victoria Jackson's sheer foundation duo compact contains two shades that can be used alone or blended together to achieve the perfect match for your skin tone. It also works as a concealer for problem areas like under eye circles and gives you complete coverage without the caked-on and layered makeup look, which is exactly what you need to achieve the natural/no makeup look. See the inspiration photos and makeup tutorial below. 1. Moisturize: Cleanse your face and apply a facial moisturizer to give your skin that youthful moisture glow. 3. Eye Brows: Using a brow brush simply brush your brows into shape. 4. Eye Lids & Lashes: Thinly line your upper lash with a brown eyeliner. Then Curl and use brown mascara on your lashes. (The key is to apply it lightly). 6. Lips: Use a sheer or tinted lip balm or lip color (stay as close as possible to your natural lip color). Then apply a clear gloss on top. 7. Finishing Touch: Complete your look by lightly applying a luminous powder to your face (i.e. forehead to chin, and left cheek to right cheek) this will add a youthful glow. Fab Giveaway: Love what you've seen? It's your turn to look fabulous while confidently spotting the natural/ no makeup look. 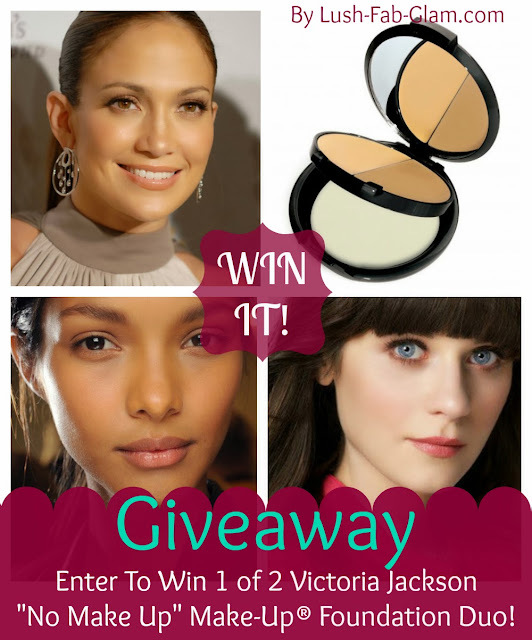 Enter below to win one of two Victoria Jackson "No Make Up" Make-Up® Foundation Duo. Contest Details: This contest ends on Saturday, November 30th, 2013 at midnight PST. Only one entry required. For more chances to win share this giveaway using the buttons below and tag Lush Fab Glam (see below for details). Winners will be chosen at random and will be notified via email within 3 days of contest end date. Thank you to VMakeup.com for this fabulous giveaway! Which celebrity natural/ no makeup beauty look is your favorite and have you tried/will you try this look? Share with us by leaving a comment below. This post brought to you by Victoria Jackson Cosmetics. All Opinions are 100% mine. Share this fab giveaway with other beauty lovers for more chances to win! When you share remember to tag @lushfabglam on twitter, @Everythinglushfabglam on Facebook and +lush-fab-glam on Google+ so we can see your share. Good Luck Everyone! I'm horrible at applying makeup so I keep it simple, this is so me!